The gown is finished and the most beautiful baby in the world has been baptized into God's family of faith. It is no secret I love a christening gown. 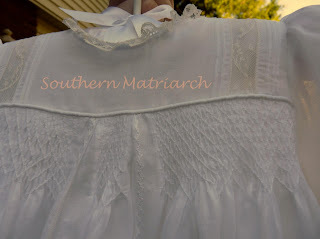 I was asked once what item do I still have from childhood that I cherish the most, I immediately answered, "My christening gown." I don't know why and I am sure there is some deep Jungian reason that is beyond my capacity to understand. All that aside, I hold it dear and secretly spirited it from my mother's possession as a teenager and still have it. It hangs in my sewing room. 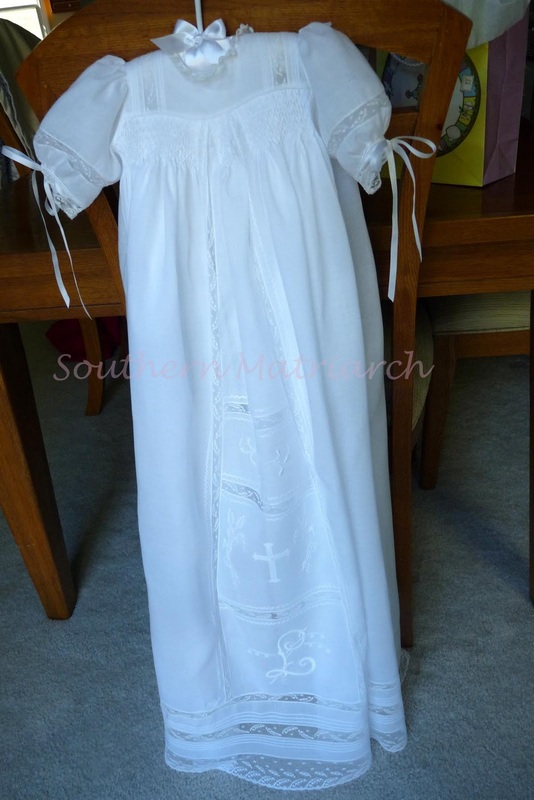 All of my own children were baptized in that gown. Sadly, it is not sturdy enough to withstand another generation's use. The upside of that is, I have the precious opportunity to make a family gown for each of my four children. This is the story of the first of those. Remember you can click to enlarge the pictures. 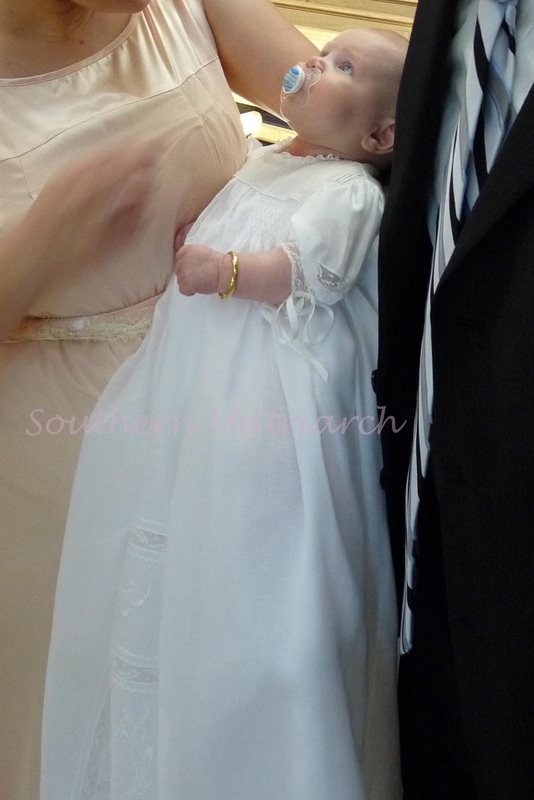 Our beautiful mommy holding her baby on the graced occasion of her baptism, October 3, 2010. It was a gorgeous, crisp fall day, the sun was shining, the leaves were beginning to turn as family and friends gathered to celebrate. And to make it even more special, my husband, an ordained deacon in the Catholic Church was to be the one baptizing this much loved child. God was definitely there in so many ways throughout the day. All of our children and their significant others were there. My husband always comments when ALL of his children are around the dinner table at one time. I always comment when they are all in the pew at Mass together. We were both happy on Sunday. It is the simple things in life. I had a heck of a time getting good pictures of the gown on Sunday morning. So I apologize for the pictures not being the best. 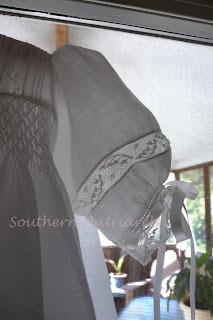 The gown is made from silky voile from BessieMary. This is not the most expensive or extravagant fabric but I love it. It is a joy to work with. I love the fact that it keeps its filmy nature after it is washed but yet it sturdy enough to handle the hand embroidery. I lined the bodice with silk organza to give it a bit more oomph to handle the weight of the long skirt. 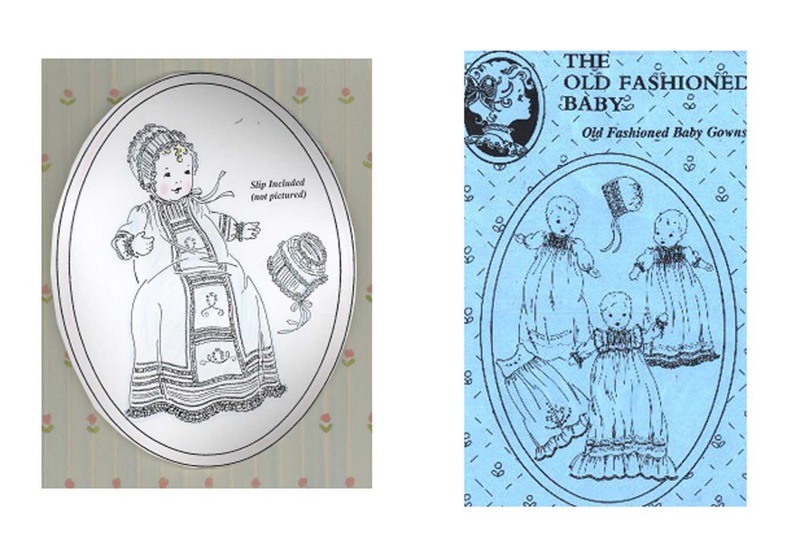 I used a combination of patterns both by the Old Fashioned Baby. 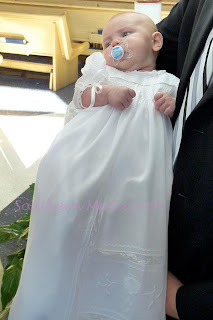 Mommy wanted the skirt of the French Acadian Christening gown and Mimi wanted it smocked, so we combined the skirt with a shortened bodice of the Baby Gowns pattern. She wanted to reverse the original sized sequence of the "squares" on the skirt, making the largest one on the bottom. She chose the symbols she wanted used and mentioned "the featherstitching" about a dozen times. So I knew that was something she wanted as well. 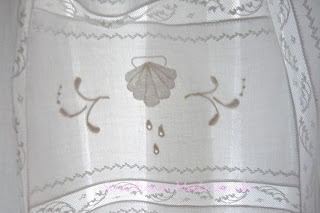 The shell used to symbolize Baptism is done in chain stitch, back stitch and shadow work. The flourishes to either side are raised satin stitch. The water drops are padded eyelets. 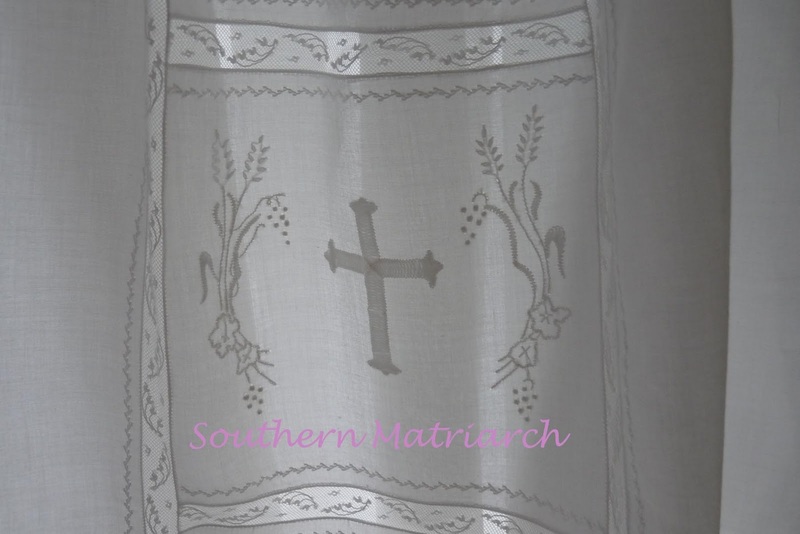 The grapes and wheat on either side of the shadow work cross are stem stitch, granitos, lazy daisies, shadow work and back stitch. It represents Eucharist. 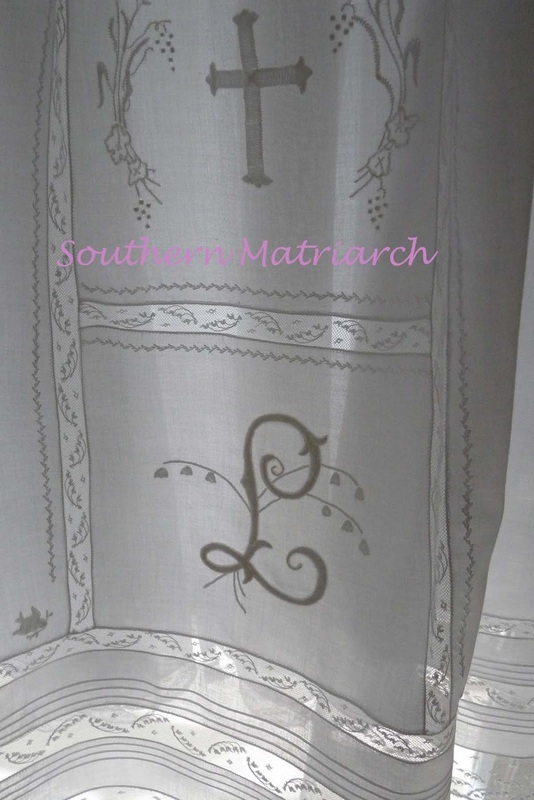 The monogram is raised satin stitch with shadow work and chain stitch lily of the valley. It was her idea to add the lily of the valley embroidery to the monogram, which coordinated with the lily of the valley maline laces used. 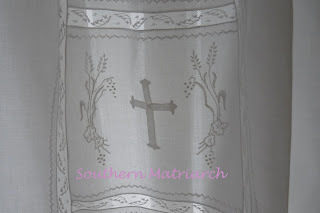 I had always planned on using this lace and had collected several widths of insertion and edgings over the years. This is one of my favorite laces. 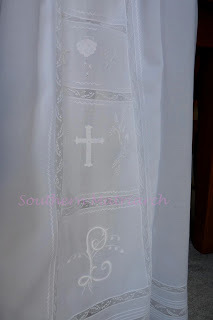 I used a combination of three sizes of lace on the lower skirt with two strips of three pin tucks each to represent the Trinity. The shadow work doves in the corner represent Confirmation. She wanted three-quarter sleeves but not too puffy and large. So I reduced the sleeve width by 3/4." By concentrating the gathering on the lower edge directly below the sleeve header gathers it still puffs nicely. The bottom of the sleeve is finished with lily of the valley beading/edging threaded with silk satin ribbon. Since I knew the beading lace would add length, I used the newborn length for the 3/4 sleeves. I also inserted lace across the sleeve. 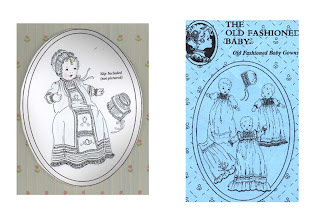 The slip is the one from the Baby Gowns pattern also made from the silky voile. Shell hems finish the neck and armholes with lace edging across the bottom. It was nippy yesterday so mommy had a onesie underneath it all. She is styling her first jewelry gifted by a friend. I made a size 6 months and it fit perfectly. She weighs between 13 and 14 pounds. The gown is a tad over 39 inches long. Mommy wanted long so that is what she got. It was fastened in the back with two sterling silver beauty pins. Ignore the bright blue paci, we switched it out to a plain white one soon after these pictures were taken. In the spirit of full disclosure I will admit that there is more feather stitching to be added along the bottom of the skirt and on the sleeves. I will do that this week along with her name and date on the back of the lower skirt. My plan is to do that this week before she has her portraits taken. There are also some things on the gown that I am not completely happy with, but you will notice I did not point them out. She was beautiful, blessed and baptized and that is what matters. Here she is with her parents and godparents before Mass. This is why I sew. I also will admit to a tear or two when we first dressed her. It makes a Mimi's heart sing I tell ya! I hope you, faithful readers, are working on something that makes your heart sing as well. Sewing something that makes your heart sing. Love that saying. Your work in beautiful. Finally, been waiting on this post all week....knew it was coming and trying my best to be patient. You are a treasure, a true gift.....and that is just what you have given to baby Evamarie. Thanks for sharing your wonderful family with all of us! Thank you for sharing so much of Evamarie's special day, her gown, and the reasons and thoughts behind the designs and symbols. I had never noticed the little doves until you mentioned them! While I love each part -- the design, the smocking, the lace and the embroidery -- the best part is the love. No greater gift. Give those eyes and hands some rest! 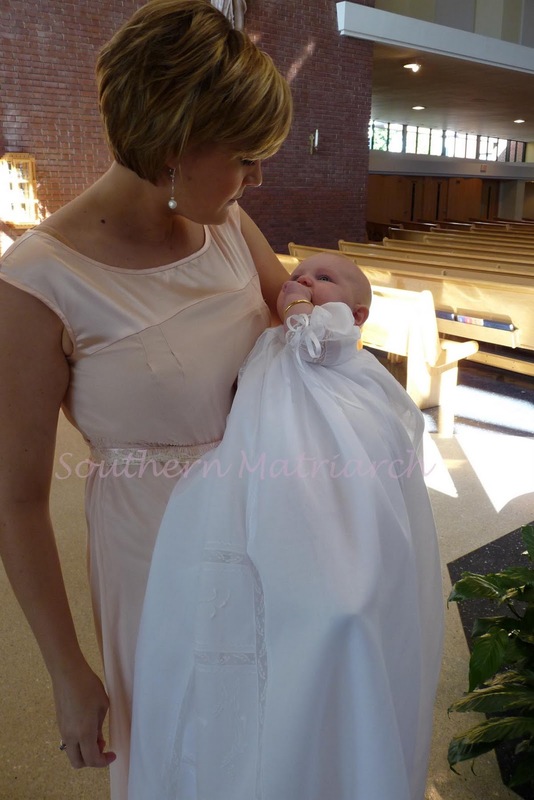 Absolutely gorgeous Martha....the baby, the gown, and the entire family!!!! Thanks so much for sharing your life and family with us!!!! I am starting on a Christening gown tomorrow for my daughter's friend. My own children wore: first one - a gown bought by her aunt, my sister, second one- a gown that I made and that her oldest has worn and that her new baby will be wearing in Dec. and our third, another gown I made. My grands have worn one or another of these three gowns so I haven't made new ones for them. These are all beautiful that you have made for your childrens' families. I'm sure they are so proud of them and will pass them down for generations to come. What wonderful picture. My favorite is where Baby is looking up adoringly into her mothers eyes (your can't see Moms whole face but you know). There are many features I love about how you did the gown. One is the way you graduated the size of the lace at the hem. 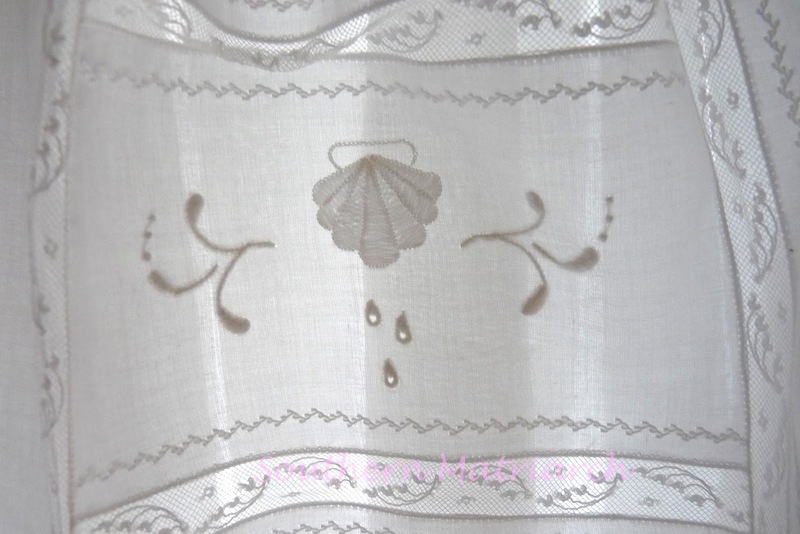 And I love the old fashioned Lilly lace. It has graced many an old Christening Gown. Beautiful! It is wonderful to create a family heirloom. Your little grand daughter is so sweet and the gown looks perfect on her. I'm glad you were able to finish in time and enjoy seeing her baptized in it. My own little guy will be baptized in 2 weeks. Congratulations to your family- so nice that you could all be together on this happy day! Such a spectacular heirloom! Your daughter looks wonderful. To think of what she and all endured after delivery is hard to believe. She looks gorgeous. And then there is baby - absolutely perfect little angel. I think is is so special that your husband was able to perform the ceremony. To me, these milestones and their celebrations are what family is about. Congratulations on everyone's good health, beauty, and blessedness. 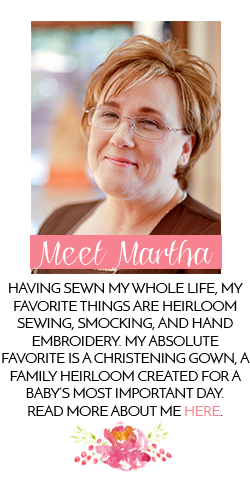 Martha, thank you for those additional details in words and photos. It is an incredible gown, for a special baby and family. I love how much her momma's desires influenced your creation. Now there are several of us who worried all week long about the state of the dress. I hope we worried so that you were content to just sew. I feel a part of the dress knowing that my pleater was used to pleat it. Makes it even more special to me. You did a fabulous job ... kudos to the design team. What a truly blessed event. Both gown and baby are beautiful. God is so good. Thank you so much for sharing! Everyday I would peek into your blog to see if you had posted any updates on the gown, and today's photos were plentiful and beautiful. So many wonderful moments, may your family be blessed with them all! Absolutely beautiful! Thank you for sharing Evamarie's special day with us. I have tears in my eyes just reading about it and seeing your wonderful photos. Hope you are getting some much needed recovery time! GORGEOUS!!! All of your work is beautiful! You must be one proud Mimi!!! You are such an inspiration to a beginner like me. Your little granddaughter is stunning in her gown. I've been really looking forward to this post to see the finished gown. It is absolutely beautiful, but more so when on the angelic little doll baby. 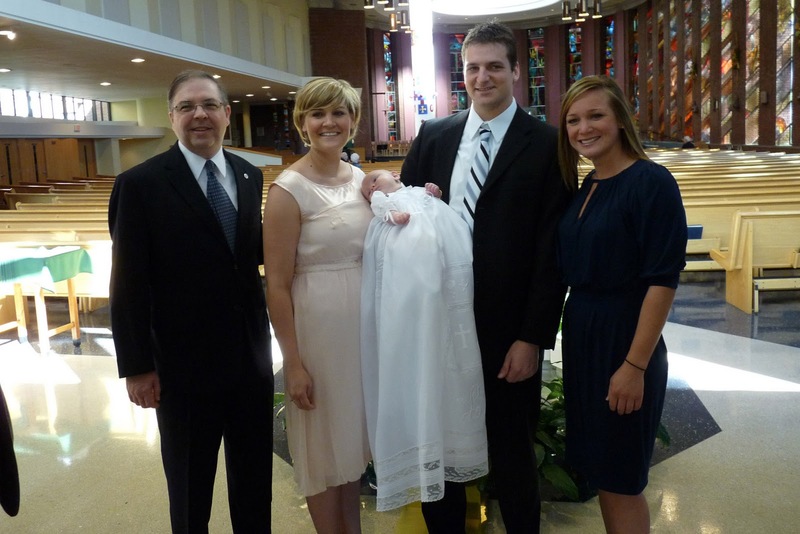 What a lovely treasured heirloom, and to have Grandpa baptize her! Thank you so much for sharing this with us. Oh, that little plump arm with the gold bracelet! Her gown is beautiful--what a treasure! 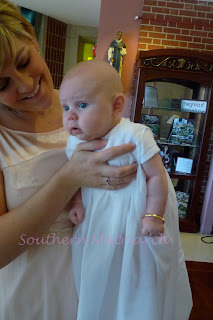 Utterly, positively exquisitely one of the most beautiful & meaningful Christening gowns I have ever seen!!! The dress is stunning! And of course, the baby is precious! 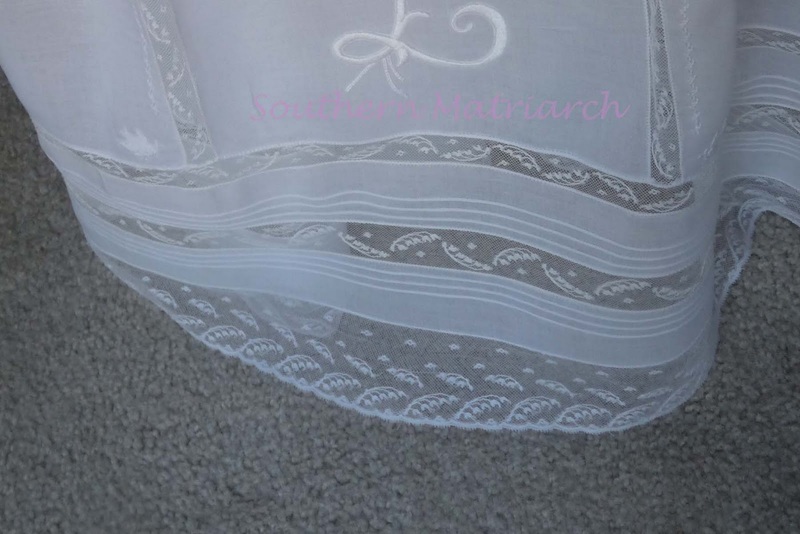 The embroidery on the front is exquisite! The whole dress is gorgeous!! Beautiful! You are inspiring this new grandmother! M first Grandbaby, Emma Jane, is due next month. Your blog is a favorite go to place for inspiration. I love the lily of the valley lace- I used it on the flower girl dresses for new mommies wedding.